When the AC75 rule for the 36th America’s Cup was released last month, there were a lot of detail for teams to pore over in their quest for the Auld Mug, however, one section has prompted a few raised eyebrows. Emirates Team New Zealand is certainly no stranger to technical innovation after unveiling its cycle-powered America’s Cup raceboat last year, which went on to triumph over Oracle Team USA in Bermuda. Keen to defend the title, the Kiwi team has come up with a rigorous class rule that should ensure competitive racing, working around the clock for several months in close collaboration with the Italian Challenger of Record. However, that’s not to say that this will be a low-tech America’s Cup, far from it, with Bernasconi bringing plenty of artificial intelligence knowhow from his days working with the McLaren Formula One team. “It’s good to get the boat out on the water, but the bulk of our design is done through simulation and optimising on a virtual boat, rather than in reality,” he explained. 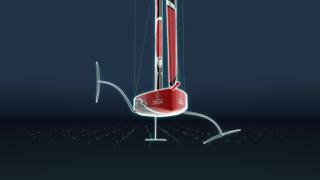 And with no test boats permitted to be launched until March 31, 2019, this virtual stage will now be the primary focus of each team hoping to lift the America’s Cup in 2021.